PASADENA, Calif. -- NASA's Nuclear Spectroscopic Telescope Array, or NuSTAR, is being prepared for the final journey to its launch pad on Kwajalein Atoll in the central Pacific Ocean. The mission will study everything from massive black holes to our own sun. It is scheduled to launch no earlier than June 13. "We will see the hottest, densest and most energetic objects with a fundamentally new, high-energy X-ray telescope that can obtain much deeper and crisper images than before," said Fiona Harrison, the NuSTAR principal investigator at the California Institute of Technology in Pasadena, Calif., who first conceived of the mission 20 years ago. The observatory is perched atop an Orbital Sciences Corporation Pegasus XL rocket. 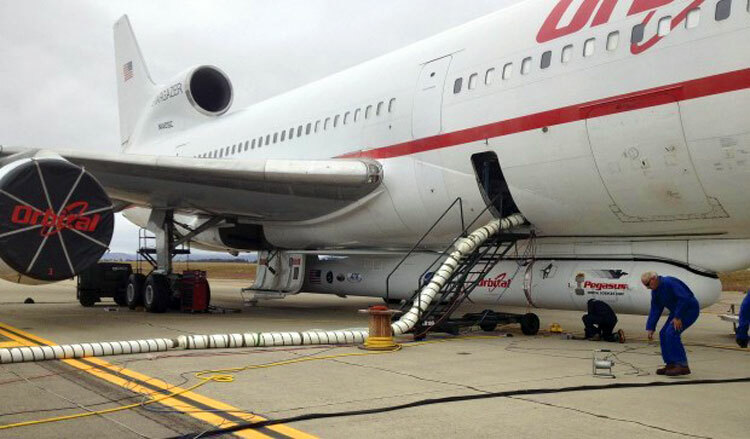 If the mission passes its Flight Readiness Review on June 1, the rocket will be strapped to the bottom of an aircraft, the L-1011 Stargazer, also operated by Orbital, on June 2. The Stargazer is scheduled to fly from Vandenberg Air Force Base in central California to Kwajalein on June 5 to 6. After taking off on launch day, the Stargazer will drop the rocket around 8:30 a.m. PDT (11:30 a.m. EDT). The rocket will then ignite and carry NuSTAR to a low orbit around Earth. "NuSTAR uses several innovations for its unprecedented imaging capability and was made possible by many partners," said Yunjin Kim, the project manager for the mission at NASA's Jet Propulsion Laboratory in Pasadena, Calif. "We're all really excited to see the fruition of our work begin its mission in space." NuSTAR will be the first space telescope to create focused images of cosmic X-rays with the highest energies. These are the same types of X-rays that doctors use to see your bones and airports use to scan your bags. 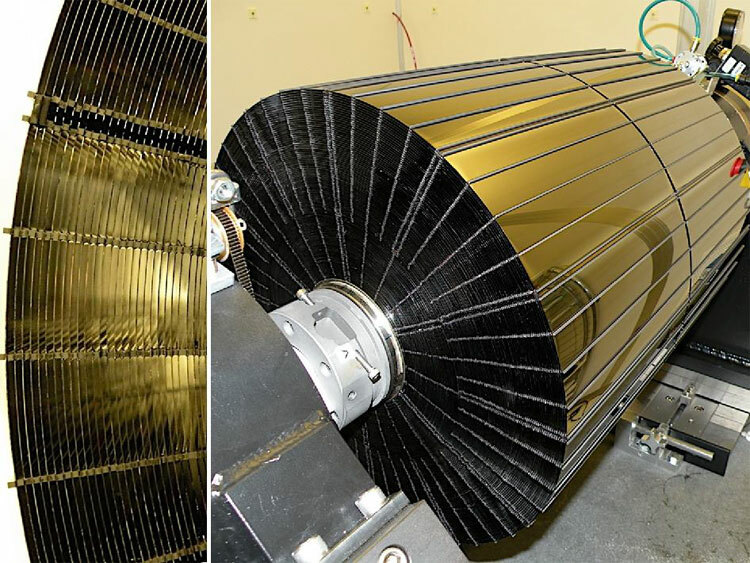 The telescope will have more than 10 times the resolution and more than 100 times the sensitivity of its predecessors while operating in a similar energy range. The observatory is able to focus the high-energy X-ray light into sharp images because of a complex, innovative telescope design. High-energy light is difficult to focus because it only reflects off mirrors when hitting at nearly parallel angles. NuSTAR solves this problem with nested shells of mirrors. It has the most nested shells ever used in a space telescope: 133 in each of two optic units. The mirrors were molded from ultra-thin glass similar to that found in laptop screens and glazed with even thinner layers of reflective coating. A small rocket and its NASA telescope will depart Vandenberg Air Force Base today, but not in the traditional way for a satellite traveling to space. 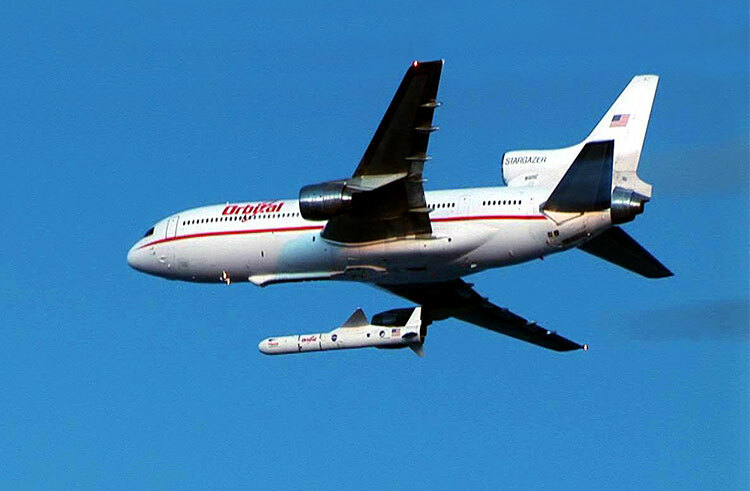 The air-launched Pegasus XL rocket built by Orbital Sciences Corp. is affixed under the belly of a modified L-1011 Stargazer that was scheduled to depart about 1 p.m. today from Vandenberg’s airfield. The launch location is more than 4,000 miles southwest of the Central Coast. Today’s flight will come after crews worked through the weekend, rolling out the rocket and satellite across the base to the airfield. Technicians then attached the winged Pegasus rocket under the aircraft. “That went very smooth,” said Bryan Baldwin, Pegasus program manager for Orbital Sciences Corp.
Sunday, crews conducted a combined systems test among several final steps to ready for departure. Baldwin is among Orbital’s 38 employees heading to Kwajalein for the mission. One-half of those workers are the firm’s Vandenberg force. He has been in the control room for every Pegasus rocket launch, 40 have already flown since 1990. “I take a lot of pride in what we’re trying to do here and what we’re trying to do for our customers. For me, it’s been a great ride,” Baldwin added. The plane and its cargo will make a two-day trek — they will spend the night in Hawaii — to the Kwajalein Atoll in the central Pacific Ocean. The three-stage Pegasus, which is some 55-feet long, is set to carry the 780-pound Nuclear Spectroscopic Telescope Array, or NuSTAR satellite. The small observatory will hunt for black holes in the universe for a mission NASA says costs $180 million. Launch is planned for June 13 PDT (June 14 in Kwajalein), after a delay of nearly three months due to testing of the rocket. NuSTAR will use advanced optics and detectors to observe black holes and interiors of galaxies with X-ray vision expected to be much more sensitive than any mission flown before. Pegasus boasts an ability to launch from several sites around the world, unlike the traditional ground-launched rockets. But it also doesn’t get the attention, as its launch occurs over water and generally out of spectators’ view. “This is the only air-launched vehicle in the world for small satellites so it really is a special airplane and a special rocket,” Baldwin said. This launch is going from Kwajalein because it’s the best-suited location for putting the satellite into an orbit that follows the equator. On launch day the rocket will be dropped from the plane at an altitude of 39,000 feet while going Mach 0.8. The rocket free falls for five seconds to get away from the L-1011 before the Pegasus’ motors fire to carry the spacecraft to orbit. Two of the L-1011’s pilots, Bill Weaver and Ebb Harris, both spent time in the Air Force and then were Lockheed test pilots. They have an impressive log of flight time, with Harris having 27,000 hours and Weaver 11,000. They are part of a flight crew of five and two launch panel operators who ride aboard the plane during the drop. The launch panel operators help monitor the rocket’s health in conjunction with crews on the ground. Once Pegasus is released, the pilots feel the separation. “It’s like a big jolt throughout the airplane. You can feel it. You can hear it,” Weaver said. As the 52,000-pound Pegasus vehicle falls away from the huge aircraft, the airplane’s nose rises “in a pretty pronounced fashion” and the plane’s center of gravity shifts. The plane rises some 1,500 to 2,000 feet to help provide separation between the plane and Pegasus, plus its exhaust. “It’s good to have that separation from the rocket when it lights up. We like that,” Weaver said. The pilots of the L-1011, which is based in Mojave, undoubtedly have the best view of Pegasus launches. They’ve been involved in 34 missions so far. “Sometimes we get to see some beautiful colors,” Harris added. Prior to this mission, the last Pegasus launch occurred in October 2008. After NuSTAR, the next Pegasus mission is set for January 2013 and will occur off the California coast. 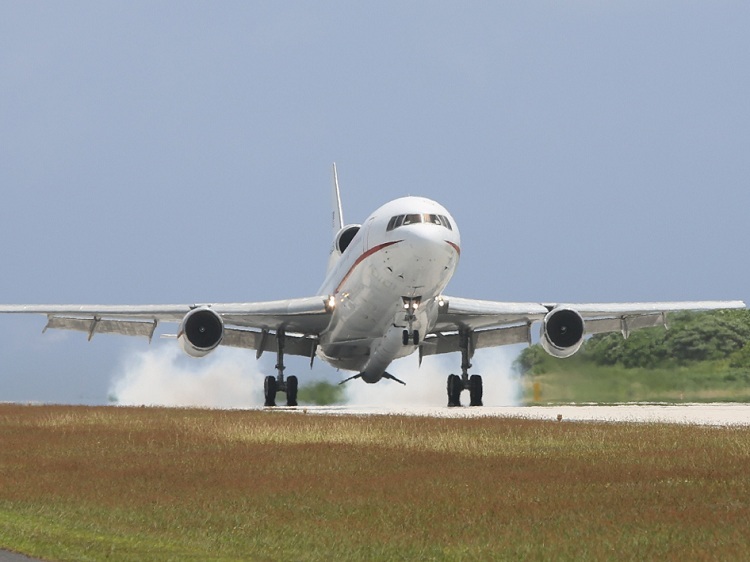 The Orbital Sciences L-1011 carrier aircraft ferrying their Pegasus XL rocket with NASA's NuSTAR spacecraft arrived at the Kwajalein launch site in the Pacific Ocean at 1:45 p.m. Marshall Islands time on June 6. The ferry flight was completed smoothly with no issues or concerns. The L-1011 flew through the launch-day "drop box" that included the racetrack pattern the aircraft will fly prior to releasing the Pegasus for launch, allowing ground controllers to test and verify the communications links between the aircraft and Kwajalein. A countdown dress rehearsal is planned for June 9. The launch of the NuSTAR telescope remains on schedule for June 13. Viele der gewaltigsten Objekte im Universum sind für das menschliche Auge unscheinbar: Schwarze Löcher, aktive Galaxienkerne und Reste explodierter Sonnen machen sich vor allem im Röntgenlicht bemerkbar. Ein innovatives Weltraumteleskop der US-Raumfahrtbehörde Nasa soll ein neues Fenster in diesen energiereichen Kosmos öffnen. Der Start des 350 Kilogramm schweren Röntgenobservatoriums „NuSTAR“ ist für kommenden Mittwoch geplant. Seine Mission soll zwei bis fünf Jahre dauern. „Wir werden die heißesten, kompaktesten und energiereichsten Objekte sehen, mit einem grundlegend neuartigen Röntgenteleskop, das viel tiefere und schärfere Bilder liefert als je zuvor“, schwärmt „NuSTAR“-Chefwissenschaftlerin Fiona Harrison vom California Institute of Technology (Caltech) in einer Nasa-Mitteilung. „NuSTAR“ (Nuclear Spectroscopic Telescope Array) öffnet den Blick der Astronomen für sogenannte harte, das heißt besonders energiereiche Röntgenstrahlung. Sie gleicht der Strahlung, mit der Ärzte Knochen oder Zähne durchleuchten. Damit schließt das Teleskop eine Beobachtungslücke zwischen den existierenden Röntgenobservatorien „Chandra“ der Nasa und „XMM-Newton“ der europäischen Raumfahrtagentur Esa sowie dem Gammastrahlenteleskop „Fermi“ der Nasa. Weil die energiereiche Strahlung von der Erdatmosphäre geschluckt wird, müssen solche Observatorien oberhalb der Atmosphäre im Erdorbit stationiert werden. Mit 165 Millionen US-Dollar (131 Millionen Euro) ist „NuSTAR“ im Vergleich ein eher günstiges Weltraumteleskop. Das Besondere daran: Dank einer ausgeklügelten Technik ist es als erstes Observatorium in der Lage, harte Röntgenstrahlung zu fokussieren, also scharfe Bilder zu gewinnen. Dazu ist eine besondere Optik nötig, denn die energiereiche Strahlung lässt sich nicht einfach durch Linsen schicken wie sichtbares Licht. Stattdessen wird das Röntgenlicht streifend von schalenförmigen Spezialspiegeln abgelenkt. Auf diese Weise arbeiten auch andere Röntgenteleskope, aber „NuSTAR“ ist das erste, dem dies für hochenergetische Röntgenstrahlung gelingt. Geht alles gut, erwarten die Forscher fundamental neue Einblicke. „Es ist ähnlich wie bei Galileo, der vor 400 Jahren als erster sichtbares Licht mit seinem neuen Fernrohr fokussiert hat“, erläutert Projektwissenschaftler Daniel Stern. So soll „NuSTAR“ etwa die erste systematische Bestandsaufnahme Schwarzer Löcher im All liefern. „Wir glauben, dass zwei von drei Schwarzen Löchern verborgen sind“, erläutert Stern. Von dem Weltraumteleskop erhoffen sich die Astronomen auch Einblicke in die Entstehung und die Physik dieser bizarren Phänomene. Schwarze Löcher sind Orte der Extreme. Die Materie ist in ihnen so stark zusammengepresst, dass nichts ihrer enorm hohen Anziehungskraft entkommt. Die „Fluchtgeschwindigkeit“, die nötig ist, um der Anziehungskraft eines Körpers zu entkommen, liegt im Inneren eines Schwarzen Lochs über der Lichtgeschwindigkeit. Daher dringt nicht einmal das Licht selbst nach außen. Schwarze Löcher sind unsichtbar, sie verraten sich jedoch über die Materie, die sie verschlucken. Wegen der extrem starken Schwerebeschleunigung heizt sich Materie, die in ein Schwarzes Loch fällt, auf Millionen Grad Celsius auf und strahlt dann hell im Röntgenlicht. Dieses charakteristische Leuchten können Röntgenteleskope registrieren.